The fifth season of Adventure Time begins moments after the cliff-hanger we were left with in season four. If I’d remembered this was going to be the case, I’d have rewatched ‘The Lich’. Not only does this season hit the ground running, but it takes two episodes for that particular story to conclude, and suddenly the moments of foreshadowing that puzzled me last season make sense. In fact, this season answers even more of mysterious questions posed in the previous one. 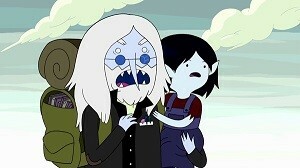 We get an entire episode focussing on Marceline’s history with the Ice King (ahem…I mean Simon). Though the Mushroom War hasn’t been fully explained, we at least understand why everyone’s favourite vampire bassist gets really sad when she thinks about Simon. To be honest, I wasn’t enjoying the first few episodes this time around. First off, it deliberately mocked my trypophobia – not cool, Adventure Time, not cool! – and secondly we got a bunch of completely off the wall episodes in a row. And I don’t mean the usual bizarre goings-on, I mean full steam ahead to crazytown, don’t worry about stocking up on the vittles beforehand. And it just got a bit…tiresome? The good news is that the collection rights itself before long, and we get some whacky adventures that at least make some kind of narrative sense interspersed with the weirdness we’ve all come to love. There are some absolutely incredible episodes here. ‘BMO Lost’ features one of my favourite characters alone in the woods, coming across all sorts of creatures, including a bubble voiced by LeVar Burton. ‘One Last Job’ introduces us to Jake’s old gang of ne’er-do-wells, including the hilarious Tiffany, whilst ‘James Baxter the Horse’ features what will quite possibly be the strangest catchphrase ever coined from the show. The fact that this is only Part 1 doesn’t have much of an effect on the purchase – you still get 26 episodes. (What’s the bet that this season is double the length of previous ones because the network wanted to eke as much as possible out of the performers before renegotiating contracts?) There’s also a 16 minute documentary called ‘Adventure Time Forever’ featuring interviews from significant crew members, including animators, producers and directors that chart the trials and tribulations behind the scenes of season one. It’s great to see some of the show’s unsung heroes (by which I mean people other than Pendleton Ward and the cast), and it’s also interesting to see how varied a bunch of people they are. There are also animated storyboards for each episode – about a minute long each – which are nice to have on the Blu-ray but not essential. So whilst I was initially put off by the attempts at pushing the envelope this season, the collection evened out soon enough. For fans of Adventure Time, this is another great collection. For those who haven’t watched before, I’d suggest watching any of the previous seasons first (and particularly ‘The Lich’) otherwise you might overwhelmed when you take this disc for a spin. Adventure Time - The Fifth Season Part 1 is available now on Blu-ray and DVD from Madman. This entry was posted in TV Series and tagged Action/Adventure, Animation, Comedy, Fantasy, Science Fiction, TV series, Vampire by Stuart Wilson. Bookmark the permalink. Writer: Tom Herpich, Jesse Moynihan, Cole Sanchez, Rebecca Sugar , et. al.